Since it's only a little over 6 months until christmas I decided to share a holiday digi stamp with you all today and thru the rest of July. Click on the picture for a larger view then just save it on your computer. For the card I made I printed it at 3.5x5 inches size. I'd love to see your creations with this. Maybe you can leave a comment with a link to your creation?Here is the card I made with it. I followed the sketch from Friday Sketchers but ended up flipping it around. 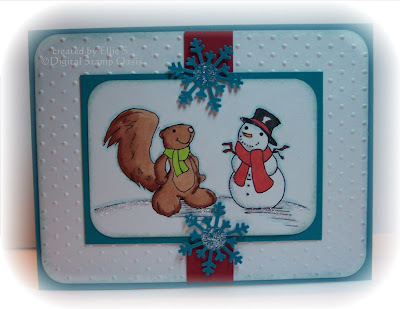 The card also qualifies for the Christmas in July Challenge over at the Whimsy Stamps Challenge. Papers used are GP white, real red, and taken with teal. Image was colored with copics. Digital Stamp Oasis is an angel company. You may sell your handmade by YOU creations at craft fairs and over the internet as long as they are not mass produced. It would be nice if you could give us credit on the back of your project, but it is not a requirement. You may NOT (re)sell any of the digital images, neither digitally nor printed out on card stock. You may NOT turn these images into rubber or clear stamps. Thank you! Thanks so much for stopping by my blog today. Hope you like the image. Added August 1st 2009: This image is no longer available as a freebie. To purchase the freebie please visit the Digital Stamp Oasis etsy store. Aw gorgeous card and I love the image. Thanks for the freebie. This must be the start of it I saw it while you were working on it . Such a cute card and an adorable image! I'll be saving it for future use...tsm Ellie!!! I can see this one being used a lot on this years Christmas cards. Beautiful card and such a sweet image! Thanks so much! Blessings to you! Wow, thanks for the image, it is adorable! This is an adorable image and card, thanks for sharing it with us! Adorable image and card! Thanks so much! Gorgeous card Ellie and thanks for the cute freebie! Brilliant seasonal card! Thankyou for the freebie, would love to use it in a couple of challenges, thanks again. Such a pretty card - great colors and dots... Thank you for the image, too. Thank you Ellie, i've used your fab image here Thanks again! Awesome way to use this image!! I couldn't wait to print it up!